The Ostrogorski Centre presents a study ‘Non-formal Education in Belarus: Expanding the Learning Space’, conducted in 2016 by Yaraslau Kryvoi and Vadzim Smok. One of Belarus’s chief strengths compared to states with similar levels of economic development is access to advanced education, a legacy of the Soviet Union rather than Minsk’s independent achievement. Unlike state-subsidised higher education, the non-formal education sector in Belarus has to survive in an unfavourable political environment, dependent on Western donors, and its reach remains very limited. This makes the situation in Belarus different from other European countries, where civil society is viewed as a partner of the state in delivering public goods and sustaining communities. There are four groups of players in the field of non-formal education in Belarus: non-formal education in the third sector, business education, confessional education, and further education in the public sector. In developed democracies formal and non-formal education complement each other, while in Belarus they often confront each other. Formal education in Belarus is controlled by the state and is often a part of the state. On the other hand, non-formal education constitutes a part of civil society. Understanding non-formal education is important to understanding the state of civil society in Belarus as well as its interaction with the state. By the end of 2015 nongovernmental organisations (NGOs) in Belarus were reporting a general improvement in conditions for civil society and human rights in Belarus. However, the conditions for their operation remain highly unfavourable. Independent civil society groups face great difficulty in registering as legal entities. Over a hundred civil society organisations are registered abroad due to the legal and regulatory obstacles they face inside the country. The main purpose of this paper is to offer recommendations on how to make non-formal education in Belarus more efficient. The authors have relied on interviews with non-formal education instructors and students in Belarus alongside analysis of the literature on the state and the aims and trends in informal education in Belarus. The paper will offer recommendations for non-formal education providers and the donors financing them as well as state educational institutions which would benefit from cooperation with the non-formal education sector. The future of non-formal education in Belarus will need to draw from these best prac-tices while taking into account the peculiarities of Belarus. Many Belarusian practitioners agree that the strategy of non-formal education in Belarus should take place in three consecutive phases: de-Sovietisation, Belarusisation and Europeanisation. However, it is also important to develop skills that allow people to operate successfully in a market economy. According to one sociological survey, the main motivation for participation in education initiatives is professional interest (51.1%), while over a third (36.6%) value the opportunity to widen their horizons and another third (34%) value the opportunity to socialise with interesting people. Along with civic participation, non-formal education should promote entrepreneurial skills, creativity, innovation and risk-taking, as well as the ability to plan and manage projects in order to achieve objectives. Charging fees for courses offering practical skills can partly help non-formal education providers alleviate one of their main problems: a lack of funds. The introduction of such market-based approaches requires additional transformations as well as business models. The projects need effective branding and advertisement strategies, orientation towards practical knowledge. According to one view, the key needs of NGOs in the field of civic education in Belarus include the need for more and better professional trainers, better organisational development of NGOs, and networks of civic education, particularly at the regional level.86 This is why there must be a focus on the multiplier effect; those who can spread knowledge and skills further and who have functional access to a wider audience need to be paid more attention. These groups include school teachers, university academics, social workers, doctors and so on. A survey carried out at the 5th Festival of Non-Formal Education revealed that one of the main priorities was to work more actively with media to make non-formal education more popular, and to explain its usefulness for state institutions as well as increasing the professionalism of Belarusian educators.88 Nowadays an effective media representation strategy plays a crucial role in the outreach of educational projects. A modern and well-structured website and active accounts on social media are a must for any project that seeks to reach young people. A more precise definition of a target audience and development of instruments to reach it could be a way of increasing awareness of non-formal education offerings in society. Practitioners also need to show how potential students can benefit from such studies, what practical results they will achieve and how they will be able to apply this knowledge in life. Non-formal education providers can boost their potential through building effective partnerships with state institutions, NGOs, and business. Although the Belarusian state remains quite a reluctant and suspicious partner, emerging cases indicate that the authorities are becoming increasingly open to engagement with civil society in areas of mutual interest. Even though recognition of non-formal education by Belarusian authorities or higher education institutions in Belarus will remain difficult for political reasons, it could be worth exploring such recognition with education institutions abroad, particularly those which run Belarus-related programmes. Obtaining a certificate from a recognised higher education institution may carry more prestige than non-formal education. Given that Belarus is one of the leaders of offshore software development89 and has one of the highest fixed broadband penetration rates in Europe,90 it would be a logical step for providers to use the internet and new technologies in education. Technology could play a particularly useful role in shaping partnership relations with universities in the European Union, which could validate and recognise knowledge obtained in Belarus, even if official Belarusian universities are reluctant to do so for ideological or other reasons. Digital badges can also play a role in non-formal learning by recognising outcomes and attracting employers and employees from outside the formal education system. Read full paper: Non-formal education in Belarus: expanding the learning space. Чытаць даследаванне цалкам: Нефармальная адукацыя ў Беларусі: пашырэнне прасторы навучання. The European Humanities University (EHU) was forced into exile in 2004 when the Belarusian authorities withdrew its licence. This followed the EHU’s refusal to acquiesce to government pressure to change its leadership. The exiled University found its new home in Vilnius, which is less three-hours by train from Minsk. The current rector of the EHU should step down soon in line with the requirements of Lithuanian law, having served two terms. The Centre for Transition Studies publishes a paper authored by Yaraslau Kryvoi and Alastair Rabagliati which aims to launch a constructive public discussion on the direction of the EHU under the new leadership, to deal with the challenges facing both the EHU and Belarusian society. The authors interviewed by e-mail and by telephone over 20 individuals related to the EHU, including its alumni, lecturers, administration, donors and well as representatives of Belarusian civil society who worked with the University in the past. Many agreed that an open discussion would benefit the university. The EHU is an important and valuable institution for the future of Belarus. However, public information and debate about the direction of the university has been limited. Most media coverage has focused on the story of the university going into exile rather than its effectiveness. This paper intends to fill this gap. With no change in Belarus on the horizon, the university needs to prepare itself for continued exile. Ten years after the EHU established itself in Vilnius, many donors continue to support the EHU as they have taken natural sympathy for their struggle. However, they are now paying increasing attention to the impact of the funding, and considering in more detail whether the University could increase its self-funding. As this paper demonstrates, the university has recently shifted its focus from Belarus-related courses, publications, staff and the Belarusian language towards an institution aiming to cater a broader group of students from the countries of the former Soviet Union. The Belarusian component was more prominent during its early years in exile. Now the vision of the University mentions Belarus primarily as a source of students, among other students from the region rather than as the main target of its activities. The internationalisation of the University, which features prominently in the description of the University’s vision for the future, is likely to lead to a decrease in Belarus-focused studies, staff and students. The EHU risks losing its distinction from other regional private universities, which raises the question about why it should continue to be eligible for donor’s support. For example, Polish universities (especially private ones, like Lazarski University) have neither specific donor support, nor a special focus on Belarus. However, their prices are affordable and Belarusians are ready to pay for the benefits of an EU education. Perhaps ironically it is Lazarski University that has organised a series of conferences on historical and political perspectives on Belarus that observers argue should be the EHU’s trademark. Another concern is that joint programmes with other universities are liable in reality only to amount to subsidising Belarusian students to study at regular regional universities rather than creating a specific Belarus focused environment. Therefore to fulfil its role as a university in exile and centre of academic development for a new generation of Belarusians, the University should retain its Belarusian character and focus on areas of “added value” for Belarus. Rather than becoming an ordinary “internationalised” university, the EHU should learn from other successful émigré universities, notably the Ukrainian Free University in Munich, which educated generations of Ukrainians. With its location away from the restrictive political climate of Belarus, areas where the EHU is well positioned to provide “added value” include political science, Belarusian history, human rights, Belarusian language and literature as well as journalism. The EHU with its new concept of internationalisation risks losing its distinction from other regional private universities, which raises the question about why it should continue to be eligible for donor’s support. The EHU has the potential to become the main scientific hub for Belarus, both for research and academic studies. In this way it would be ideally placed to obtain further funding (such as through EU university research programmes) or donor support (linked to democratisation in Belarus). The EHU could work on meeting the need for high quality research on Belarus, especially linked to developing concrete plans for reforms in Belarus. Currently there is a lack of organisations that are able to perform this role. To increase interest among young Belarusians in programmes such as political science, history or Belarusian studies the university should not only offer scholarships but also recruit and retain high calibre academics working in these areas providing them with job security guarantees typical for EU universities. The paper suggests establishing a robust disclosure mechanism of research, teaching and policy impact based on measurable indicators. This mechanism could take the form of expanding existing oversight bodies to ensure that relevant donors, implementers, Belarusian civil society, Belarusian diaspora and the Lithuanian government all have a chance to review reports and be consulted on the most important decisions. 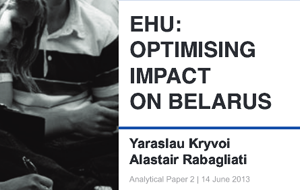 While the aim of a sustainable EHU, less dependent on donors’ funding, is supported, this paper argues that donors should continue to firmly back the EHU as a valuable institution, which could play a unique role in the future of Belarus. External support, however, should be targeted at the “added value” areas while other EHU programmes could be paving the way for self-funding.